Providing you the best range of rubber roller, film plant rolls, rubber rolls, teflon sleeve coated roller, mdo nip rollers and lamination roller with effective & timely delivery. Material MS , SS , Aluminium . 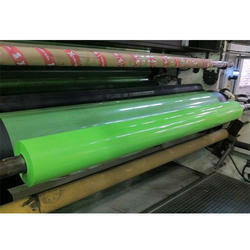 Usage/Application Printing,Paper,Textile,Lamination,Plastic,Packaging,Sheet Metal,Film Plant etc. With our wide experience and knowledge, we are now involved in manufacturing and exporting a wide range of Rubber Roller in the world. 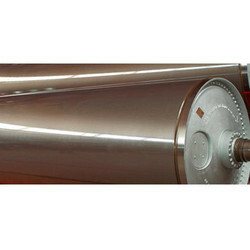 We are actively engaged in offering quality assured Film Plant Roller. Provided gamut is manufactured by engineers with the assistance of quality assured raw materials and modern techniques. Additionally, the proffered assortments are loved by patrons for many grounds like cost effective rates, durable, designs and smooth finish. Anar Rub Tech Pvt Ltd manufacturing customization of Teflon Coated Products on various parameters as per the client's requirement. Our Teflon Coated Products comes with excellent finishing and available in varied specifications. 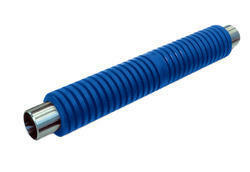 Offering our quality of MDO Nip Roller that is available at most reasonable price. MDO Nip rollers can be used to laminate sheets using wet adhesives, film adhesive or parts covered with hot melt glues or contact cement and many more. One can avail from us a wide range of Lamination Rollers, as we are considered one of the top most manufacturer and supplier in the world. Our Engraving Rolls, which provide superfine embossed prints.Manufactured using quality raw material, these rollers are used for all types of fabrics such as dupattas, grey cloths, sarees, dress, velvet, denim and many more. Anar Rub Tech Pvt. Ltd specializes in the manufacture of close-tolerance rubber covered rollers made with a wide variety of rubber coatings including, neoprene, Urethane, Buna N, Nitrile, EDPM, Silicone, Fluorosilicone, Viton, Tan Gum, Natural Rubber, Hypalon and other types of rubber in Shore A and Shore D harnesses. Rubber Grooved Spreader Roller When both the polyband and expander roller are not suitable, comes the need of Rubber Grooved Spreader Rollers. These have a distinct groove pattern on rubber surface and are capable of handling delicate films without any damage during the entire wrinkle removing process.The rubber grooved rollers are very extensively used on Film Plants as a wrinkle remover, because these do not damage the film of any gauge due to resonance effect that delivers minimum stretch to the film and reduced contact area between film and the wrinkle remover. 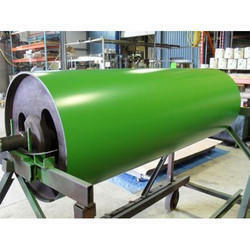 Its types as following Two or four starts scroll type RH & LH Individual Groove Type RH & LH, We are very well known for providing the superior quality Rubber Groove Spreader Roller to our clients as per their demand. They are basically rubber roller having unique groove pattern on the rubber surface. 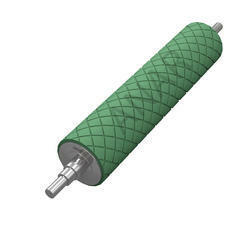 The cushioning and resonance of Grooved Spreader Roller are achieved due to groove pattern, which makes these rollers capable of handling delicate films without any damage during wrinkle removing process. Ideal for the very delicate web-like metalized film. Individual groove type RH & LH. Two or four starts scroll type RH & LH. Offering our quality Film Plant Roller that find application in plastic, paper & packaging, polyester, film, foil, ply wood, steel industries, rolling mills etc. Fabricated using the best grade materials, these rollers are known for pressure resistance, abrasion resistance and high durability. 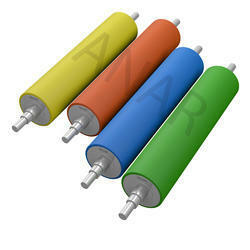 Anar Rub Tech Pvt Ltd the manufacturer & supplier best quality of cylinder drying range machine roller as well as our product is used in textile industry machine at reasonable price in India. Notes: Above price may vary as per customer requirement related to OD/ID and the length depends on market needs.